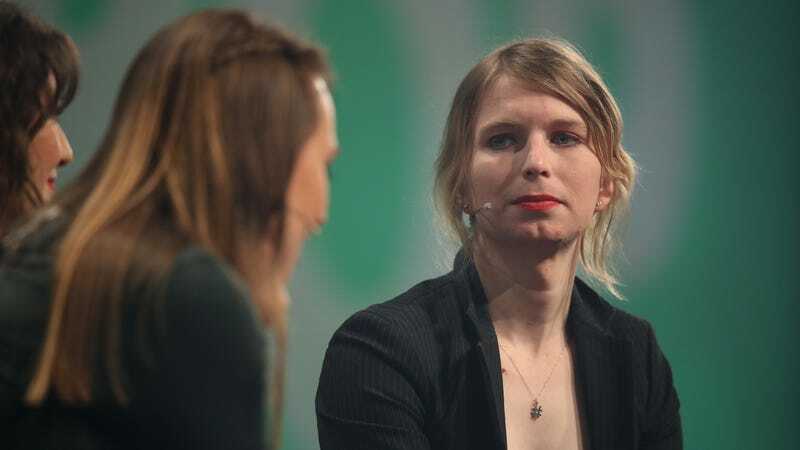 Whistle blower and activist Chelsea Manning, in what she said is her first trip outside of the United States since she was released from a U.S. prison, speaks at the annual re:publica conferences on their opening day on May 2, 2018 in Berlin, Germany. The Federal Bureau of Investigation is refusing to make public any records it has amassed on whistleblower Chelsea Manning, even though the former U.S. Army intelligence analyst waived her rights under the Privacy Act and requested in a letter that her more-than-8,000 page file be released. In response to a Freedom of Information/Privacy Act request, the FBI stated the records were considered exempt from disclosure because their release could reasonably be expected to interfere with ongoing law enforcement proceedings. While the bureau’s explanation for withholding the records offers no other details about the investigation to which they apparently pertain, it suggests that Manning’s files may be central to the U.S. government investigation of WikiLeaks founder Julian Assange, who has been charged under seal by prosecutors in the Eastern District of Virginia. While agency letters responding to FOIA requests are generally standardized and, internally, aren’t considered “official statements” on behalf of an agency, the FBI’s rejection of the request—and Manning’s appearance last month before a federal grand jury in Virginia—appear to lend credibility to anonymous sources in the Washington Post, who’ve claimed the case against Assange is unrelated to events surrounding the 2016 U.S. presidential election. The fact that the FBI has assessed that releasing Manning’s files would likely interfere with enforcement proceedings could indicate that her 2010 disclosure of classified material to WikiLeaks plays a larger role in the Assange case than previously reported. Manning, who would later apologize for her actions in court, admitted to leaking more than 725,000 classified U.S. government documents to WikiLeaks following her deployment to Iraq in 2009, including diplomatic cables, battlefield reports, and five Guantanamo Bay detainee profiles. Among other reasons, she cited the “seemingly delightful bloodlust” of U.S. aerial weapons teams as a primary motivation for the leak, in addition to the military’s collaboration with Iraqi authorities, which she claimed intelligence reports showed had employed torture against political dissidents. Ultimately, Manning was only charged with leaking portions of 227 classified documents, among them 44 diplomatic cables that have since been declassified. A Defense Intelligence Agency review later determined the leak posed only a moderate to low risk to national security. A Privacy Act waiver signed by Chelsea Manning in September 2018. Manning’s attorneys have asked the Fourth Circuit Court of Appeals to release her from jail pending her appeal, saying the District Court failed to consider her arguments against being forced to testify. After her arrest, she was held in solitary confinement—or what the jailers call administrative segregation—for 28 days. She was placed with the jail’s general population on April 4. “The FBI’s response will be appealed in its entirety and requests relating to Ms. Manning will continue to be filed through MuckRock,” she added.